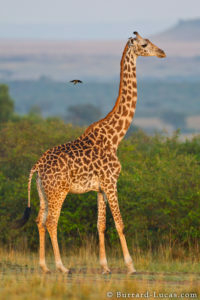 A giraffe in the morning light, Masai Mara, Kenya. I first felt this shock, of recognition mixed with unfamiliarity, when I read her debut collection A Hunger in my early twenties. I wanted, passionately, whatever she was having. She’s written just three books since, with another one, I’ve heard, to be published posthumously. Each one feels like a gift from a seer who has repeatedly gone to a place most of us can only vaguely picture, to bring back The News of what it is to be a body-bound soul. It took a rare talent and, I think, a rare courage, to live as fully as Lucie did in the realm of the active imagination. Although she was deeply invested in her students and had (as I understand) deep, warm, loving relationships with her many friends, she was also a devotee of her art who formed her life around its practice in a way most of us are not built for, or willing or able to do. You can, however, taste the strange, elemental fruit of this devotion when you read her poems. At the level she worked, imagination becomes intuition becomes a kind of mindfulness that enters into conversation with the timeless Now. You enter that conversation with her, and do not emerge unchanged. To the Queen Who fed him rose petals from her hand. So they could learn firsthand About anatomy. What is it in me Makes me tell you of these sights.